Is the revolt in Syria part of an age-old conflict between Sunni and Shiite Muslims? 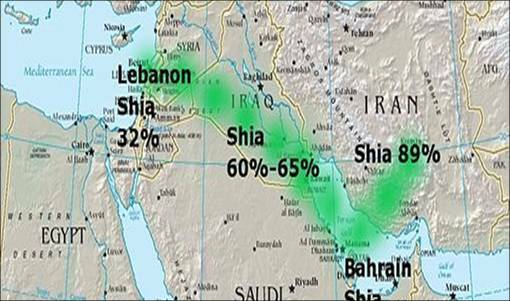 Iran and Iraq have Shiite majorities, Hezbollah represents the Shiites in Lebanon and Syria’s government has long cultivated the Shiites. The rebels in Syria are Salafi Sunni Muslims supported by the Sunni Muslims of Saudia Arabia, the Gulf oil sheikdoms and the Muslim Brotherhood. But if it is part of an age-old conflict, why does this conflict lie dormant for generations and then suddenly flare up? Pepe Escobar of Asia Times has an explanation. He wrote that the religious conflict is being instigated to block plans by the governments Iran, Iraq and Syria to build a pipeline from the Mediterranean to the rich Persian Gulf natural gas field lying between Iran and Qatar. Yellow lines show proposed pipeline routes. Dark lines are existing pipelines. The Iran-Iraq-Syria gas pipeline is an economic threat to Saudi Arabia and the Persian Gulf oil sheikdoms, who are the main financiers of the Syrian revolt. It would enable Iran to export oil even if the Strait of Hormuz in the Persian Gulf were closed. The proposed pipeline also is contrary to the economic interests of Turkey, whose government supports the Syrian revolt. Turkey has access to the natural gas of Azerbaijan and Turkmenistan. The Turkish government’s goal is to extend a pipeline to the heart of Europe and offer an alternative to Europe’s dependence on Russian natural gas. 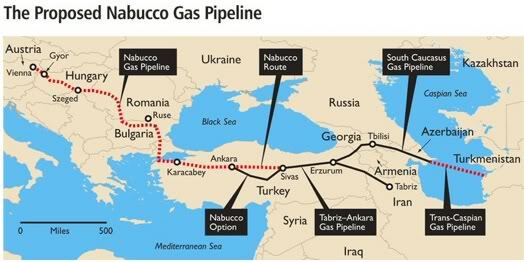 The Nabucco pipeline could serve Iran, but the Turkish government for now has decided to deny access for now. What is the national interest of the United States in this? An Iran-Iraq-Syria pipeline would not necessarily compete with U.S. companies engaged in hydraulic fracturing for natural gas. The gas would only be available to customers that could be reached by the pipeline. But there would be no detriment that I could see to U.S. consumers. The U.S. objection is that it would hamper the U.S. not-so-cold war against Iran, which is being waged largely in support of Israel and Saudi Arabia and partly in revenge for the U.S. national humiliation in the Iranian hostage crisis of 1979. I don’t think economic warfare against Iran is in the interest of the American people. I think the policy of the United States should be to wind down that war rather than extend it. War against Iran, Iraq AND Syria? by Pepe Escobar for the Asia Times. The Geopolitics of Gas and the Syria Crisis: Syrian “Opposition” Armed to Thwart Construction of Iran-Iraq-Syrian Gas Pipeline by Dimitri Minin for the Center for Research on Globalization. Nabucco’s Future and Syria’s Convenient Civil War: the End of the Iran-Iraq-Syria Pipeline by a Turkish blogger. Are Syria and Pakistan Pieces of the Puzzle for a Mega-Gas Pipeline to China? by Mahdi Darius Nazemeoye for the Center for Research on Globalization. This entry was posted on July 26, 2013 at 6:12 am and is filed under Energy, International, Religion, War and Peace. You can follow any responses to this entry through the RSS 2.0 feed. You can leave a response, or trackback from your own site. Reblogged this on The Deliberate Observer. Is this what Syria war really about? Thanks Phil for this rich analysis. that’s sad for the Syrian people.